Our dear, sweet and talented friend, Amy Tsuruta, is back for her second appearance to celebrate our 3rd Birthday Bash. If you missed her fabulous first post please CLICK HERE. As always it is a pleasure to have Amy here on the w&w blog! Hello! I'm so thrilled to be back again on the Winnie & Walter blog! I have several projects to share with you so let's get started! First up is a card that was inspired by a package of washi that I own. I'm always on the hunt for great color combo's, what do you think? I started off with the Scenery: Stripes 2 and then layered the surprise sentiment from The Big, the Bold and Baby set. 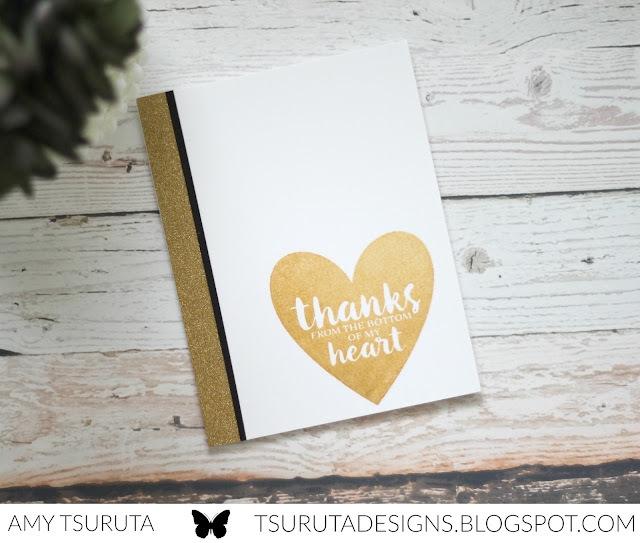 The sweet has been heat embossed in white on black cardstock and is from the same set. A clean and simple card but check out that shimmer! The gold detail strip on the left is washi that I have secured on with a strip of adhesive. I finished off the card with a strip of black, the right amount of boldness to the design. That's it for me. A big shout out to Shay for inviting me to the party, I had so much fun! From the stunning simplicity of the first, to the gold glamour of the second, to the coffee charm of the third, you've created a trio of delight! Inspired and inspiring! Wait, you cut out your own coffee cup?! That is so awesome, Amy!!! Great use of sketchy thoughts on the sleeve. So smart to adhere your washi...I get so annoyed when it comes up. It's tape, for heavens sake! 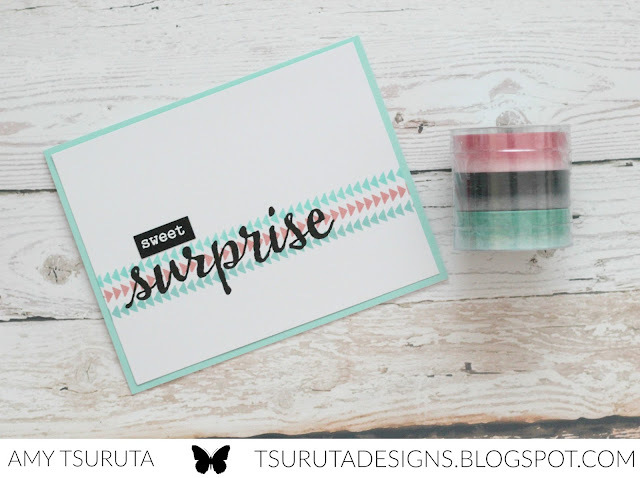 Love the color combo for your first card, and that you were inspired by the washi set. Wonderful guest post, Amy!!! So happy to see you here! Beautiful set of cards!!! The last one is my fav!!! Busy, busy girl, lol! Well now they're all pretty but you know I'm going to say the white, gold and black is my fav color combo and of coarse there's a heart too, lol. Thanks for sharing and inspiring. you have really had a party of your own in the amy T. playroom! LOve the color combo, that glam gold, and your personally cut coffee cup-extraordinaire! The sketchy thoughts are my own personal favorite of the entire release! I can see us using these quite a bit, right? Oooh, those washi inspired colors are so yummy and I always love a great coffee project. Thanks for sharing your sweet designs with us Amy! Great cards but the coffee card is my favourite! Love the wash of matching colour. Gorgeous! Ooh I love how simple and beautiful the first two are, and the third is quite extraordinary! Love all your cards, Amy! That first one has a gorgeous color combo--soft & feminine which I love! Super fun projects! My fave is the coffee cup and ink smooshed background! These are awesome cards :) i love the cas designs of all of them. So pretty and inspirational! Love the CAS style. Very nice projects!! Great cards! I really like the color combination on the first card. That is one awesome coffee cup! Love the simplicity of the designs you created! Thanks for sharing! 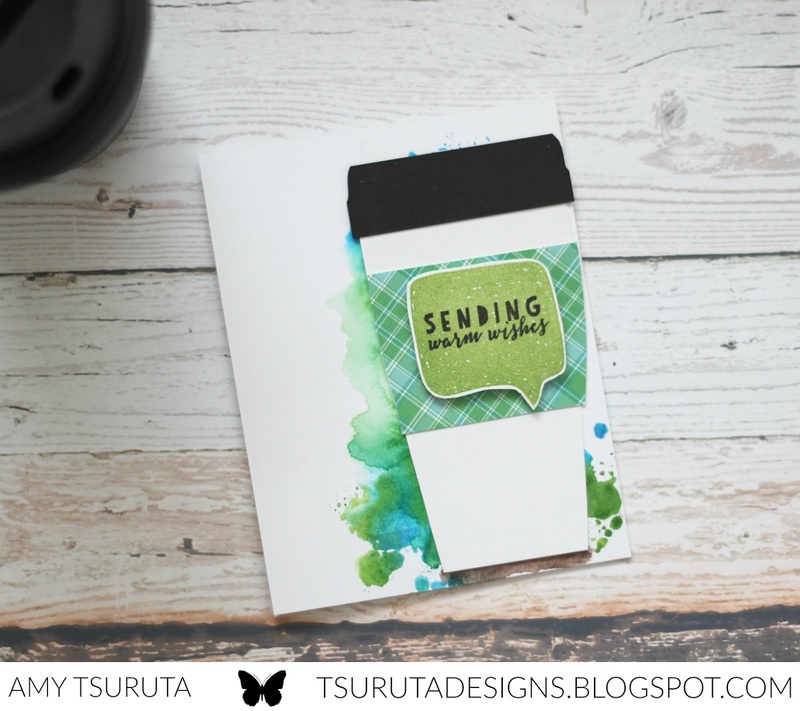 Love all the white space in the backgrounds of your cards! I need to try this! Thanks for sharing, Amy! You did it again, Amy!! I love your style!